Last weekend, I woke up and thought ‘I know what I want to do’. 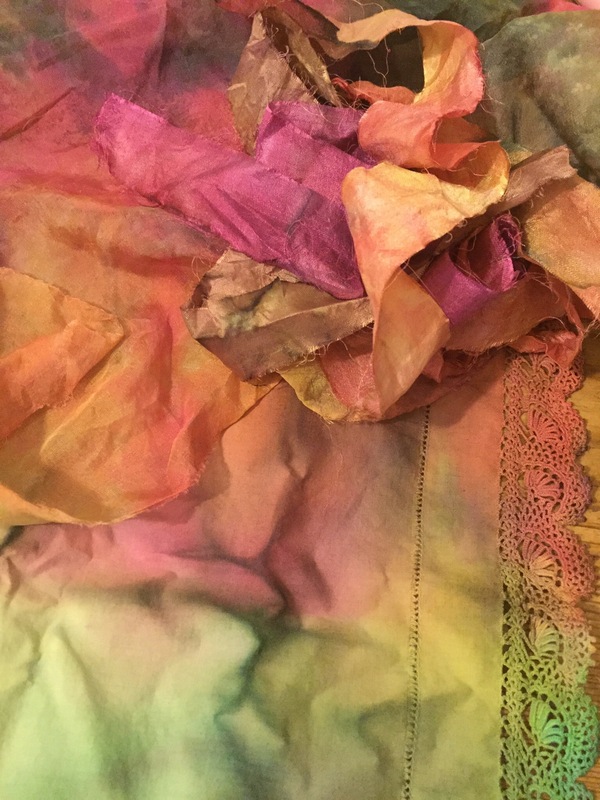 I had been mulling over for a few weeks exactly how to put some thoughts together for a new textile piece – hopefully for our group exhibition. 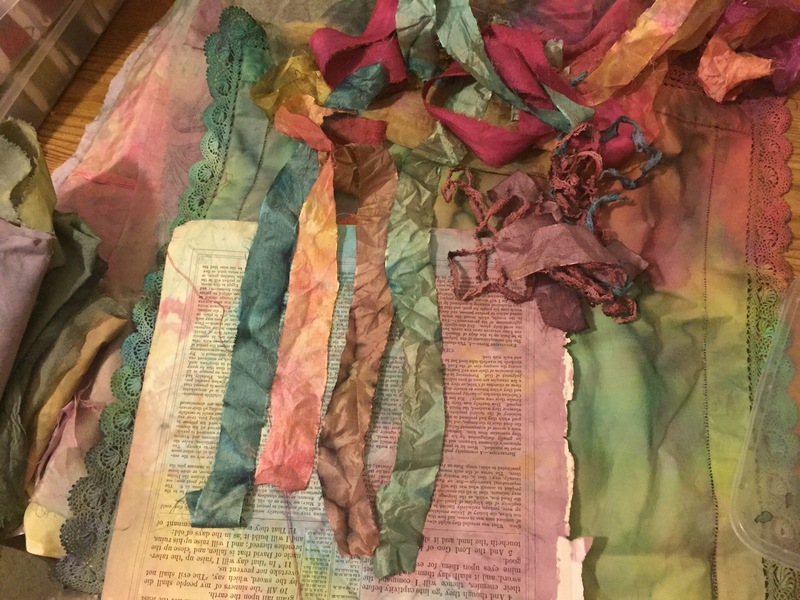 After that it was a frenzy of activity, gathering paper and fabric and winding yarn and placing them all into piles of potential. What was serendipitous was post from Kim that morning about Tchaikovski and his thoughts about creativity. This links to a previous post called ‘musical chairs’. He describes creativity as a furious thing, rather like plant growth following germination, but he also recognises the graft one has to put in to keep the process moving. This is also described as being ‘in the flow’…those times when you don’t know where the time has gone! The thing is, I ended up in the flow literally! 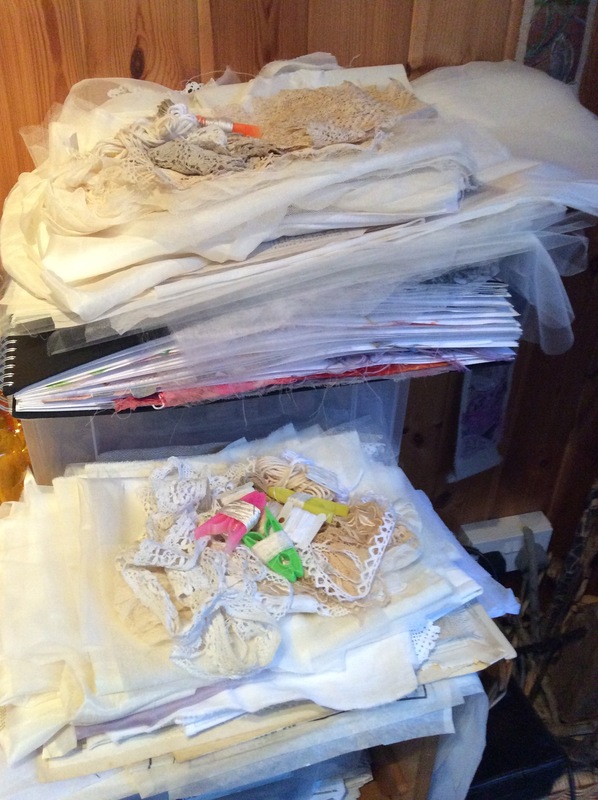 Gorgeous piles of wet paper and fabric all over the shed, making me very happy. I couldn’t sleep in the next morning as I was too excited to see how they had dried. Now during such moments, my menfolk recognise that the girl is ‘off on one’. They know they may come to the shed for one of two reasons: either it has to be a matter of life and death, or to bring me a cup of tea and a chocolate biscuit. I haven’t been asked what time lunch will be for some years now. They have learnt. As the door opens, there is usually a certain look in their eyes which begs ‘please, please don’t ask me for my opinion or any other comments about what you are doing. All I can see is a total mess and I know you think this is a beautiful thing, but I just need to get back to my ordered space and do some deep-breathing in front of my clean and tidy computer. I don’t understand and I need to leave..NOW’. I usually let them, but there was this one time when the other half brought just a cup of tea – no biscuit. I gave him the single eyebrow lift and asked him his opinion on something. He broke out in a sweat but I’m pleased to say my dietary requirements have been met ever since. Today I have another pile to do – complete happiness! 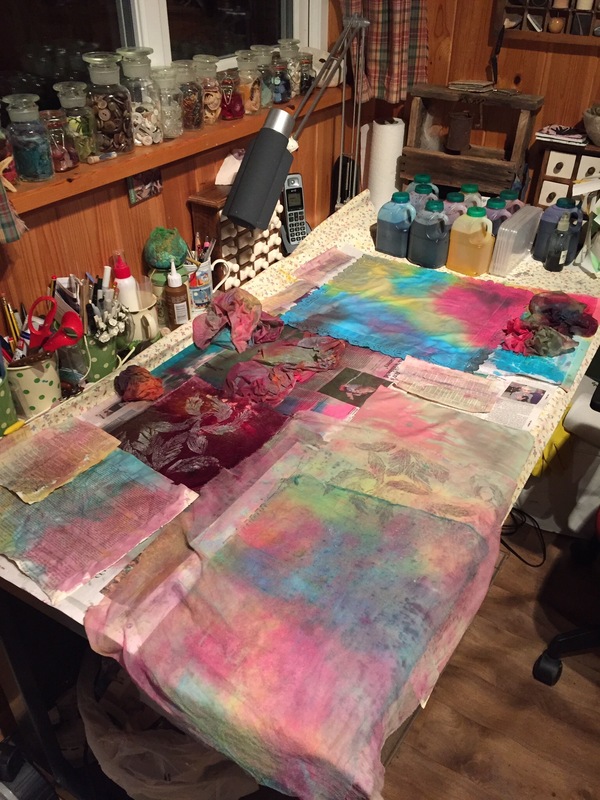 The plan is to use them all to layer up small feather-like elements that will move from stronger colours and tones down to really faded ones. Trouble is, I find myself procrastinating and haven’t done one yet. I think I’m feeling if I do one and I don’t like it the image in my head will crumble. I’m trying to consider the lessons The Thing taught me, and I have designed this project to have small elements so that the risk is reduced. I’m hoping that making the feathers will be really playful. I’m putting in practice some lessons from Experimental Textiles in that I know the tones and layers I love, I have made some original string print blocks, and I know not to outline the feathers in any way so that the eye is drawn to the overall textures and colours rather than strong shapes. Well, off to the shed now to get into the flow. I know you understand.